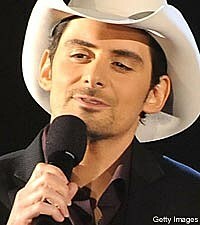 Reigning CMA Male Vocalist of the Year Brad Paisley is enjoying huge success these days, selling millions of albums and performing in front of sold-out crowds. Now, he is putting his years of experience to use by helping launch a new artist, Jerrod Niemann, on a brand new record label, Sea Gayle Records. Already co-owner of Sea Gayle Music Publishing, along with Frank Rogers and Chris DuBois, the trio are now forming the new label together. It will be an imprint of Brad's current record label, Sony Music Nashville. Jerrod, who is the only artist on Sea Gayle Records' roster so far, has written for the publishing company for the last five years. He has penned songs for the likes of Garth Brooks, Jamey Johnson and Neal McCoy. Brad, who recently admitted he was looking forward to some time off, will hit the road again in January to continue his American Saturday Night Tour, along with opening acts Miranda Lambert and Justin Moore.